The Cactus Stabbers brings you an edited collection of reprinted articles from Christianity magazine featuring the best of those fabulous epilogues that Lucas has written for years but tended to get lost once you'd finished with the magazine. Enjoy a refreshing to re-read of all those insightful chapters or discover Jeff's worldwide wanderings and musings for the first time. As ever Jeff Lucas is engaging, hilarious and meaningful - all at the same time. Be enriched as you enjoy the read and meditate for a while on the issues he raises - both challenging and reassuring. As the title suggest, this is an anthology of (many) anecdotes introducing you to the strange, the familiar, the wonderful and the unexpected - but every story makes a believable and genuine point. Full of short, snappy and meaningful fun, this book is an ideal match to any Christian reader with a sensw of humour, an interest in God's wider world and unafraid of short bursts of pure prayerful intensity. In The Cactus Stabbers... and other bizarre encounters and reflections, Jeff Lucas brings the light touch and deep insight of his own unique style to those important yet sometimes difficult to grasp truths of the Christian faith. Truths that only show up when your not expecting them, in places you weren't expecting and through the people you least expected. The secret of Jeff's success is it the way he combines humorous stories from his own experiences with profound spiritual and scriptural teaching. The Catcus Stabbers sees Jeff apply his winning formula to a varied, fascinating and sometimes frankly astounding accounts of his travels and the people he's met along the way. Now Jeff stands back and considers his experiences in the light of his own spiritual journey reflecting on these funny and not so funny - yet all so human encounters. In doing so he prises opens a door on some of the secret rooms in human nature and finds some real treasures of compassion, endurance, courage and generosity hidden away where you'd least expect to find them. The Cactus Stabbers seamlessly weaves story, human experience and spiritual insight to create a transformative view of God, man the interaction we call real life. Anyone seeking an honest Christian reflection on the everyday universe of normal - and not so normal life, won't be disappointed by Jeff's book. 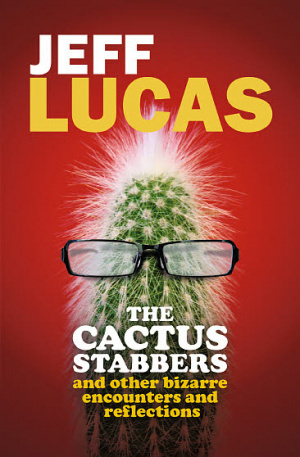 The Cactus Stabbers by Jeff Lucas was published by CWR in October 2014 and is our 3066th best seller. The ISBN for The Cactus Stabbers is 9781782593270. Be the first to review The Cactus Stabbers! Got a question? No problem! Just click here to ask us about The Cactus Stabbers. Jeff Lucas has lots of intriguing stories from his travels. But one thing is the same in every country he visits: human nature. The Cactus Stabbers is the kind of book that makes you laugh one moment and ponder life's big questions the next. We all know the kind of people who seem more passionate about football or gardening than we are about Jesus, or the kind of people who can say more in their quiet listening than we could in a thousand words. Jeff re-tells the stories of those he has met on his travels, as he looks at life through a critical, yet optimistic, lens. Jeff's not afraid to step back and take a look at his own life once in a while, and invites us to do the same.